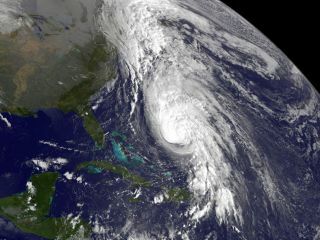 Hurricane Rafael was spotted by NASA's GOES-14 satellite at 7:45 a.m. EDT on Oct. 16, 2012. The bright white clouds mark the strongest storms in the hurricane. Tropical Storm Rafael strengthened into Hurricane Rafael late last night (Oct. 15), and a NASA satellite caught sight of the swirling storm early this morning. Rafael first became a tropical storm on Oct. 12, just as its predecessor, Tropical Storm Patty, was waning. The storm strengthened as expected and was declared a hurricane by the National Hurricane Center (NHC) as of 5:45 p.m. EDT, making it the ninth hurricane of the 2012 Atlantic hurricane season. While it is the tail-end of hurricane season, which officially ends on Nov. 30, a peak in hurricane formation is seen in mid-October in historical trends. This secondary peak, which is smaller than the main peak in August and September, comes from a unique mix of still warm ocean waters and atmospheric conditions that can still spawn storms, according to the Capital Weather Gang, a weather-focused Washington Post blog. Hurricane Rafael has maximum sustained winds of 90 mph (150 kph), as of the most recent NHC update, making it a Category 1 storm on the Saffir-Simpson scale of hurricane strength. NASA's GOES-14 satellite spied the storm from its orbit and took an image at 7:45 a.m. EDT today (Oct. 16). The hurricane is about 250 miles (400 kilometers) south of Bermuda and heading to the north-northeast. The storm is expected to pass to the east of the island later today; its center will be far enough away that Bermuda will likely only see the tropical storm-force winds at the edge of the storm, and a tropical storm warning is in effect for the island. The satellite image shows that the strongest thunderstorms within the hurricane are on its western side — the bright white clouds there are evidence of the strong convection (the overturning of air that drives the storms) taking place, according to a NASA statement. Rafael could bring rains of 2 to 4 inches (5 to 10 centimeters) to Bermuda and will likely cause dangerous surf conditions there and along some parts of the U.S. East Coast, according to the NHC. Hurricane hunters have been monitoring the storm and say that it still appears well-organized, but it is expected to weaken as it moves northward and into less favorable conditions. The NHC forecast predicts that Rafael will be a post-tropical storm by Thursday morning (meaning it will have the strength of a tropical storm, but has moved out of tropical waters). Rafael is the 17th named storm of the 2012 Atlantic hurricane season, which was expected to see 12 to 17 named storms, according to an updated August forecast (storms must achieve tropical storm status before they are named). That same forecast predicted five to eight of those storms would become hurricanes, so the number of actual hurricanes has surpassed the expected number. This story was provided by OurAmazingPlanet, sister site to SPACE.com. Reach Andrea Thompson at athompson@techmedianetwork.com and follow her on twitter @AndreaTOAP. Follow OurAmazingPlanet on Twitter @OAPlanet. We're also on Facebook and Google+.